Got a stock of fresh cucumbers piling up? 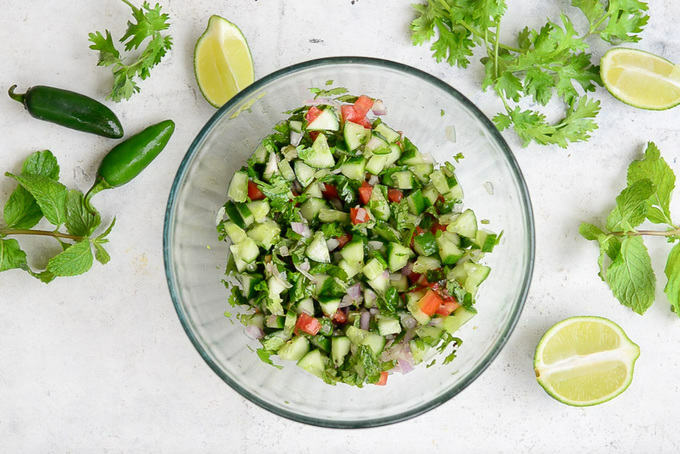 This zesty Cucumber Salsa is a great way to use them up! 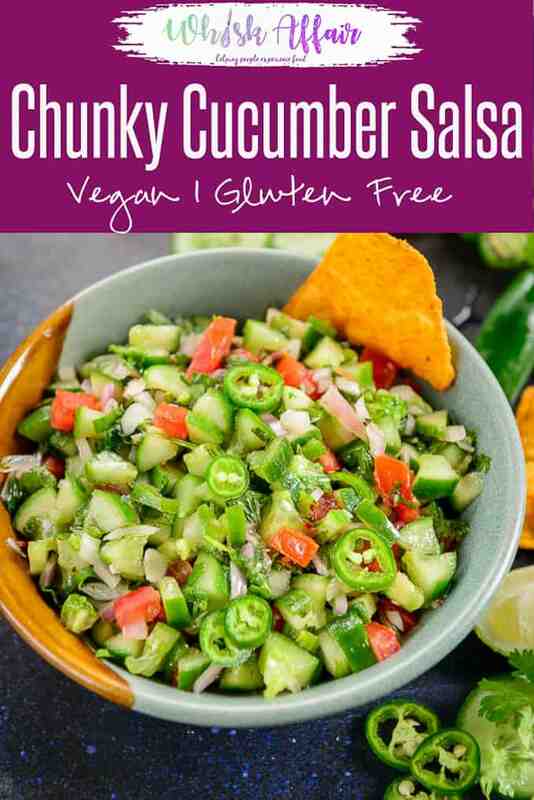 Loaded with full on Mexican flavours, I find recipe for cucumber salsa very helpful for snacks and brunches! So, do try this quick and easy salsa with fresh cucumber at home with my recipe. And enjoy it with tortilla chips, nachos and tacos. Here is how to make cucumber salsa recipe. One of the famous Mexican sides, Salsa is something that one simply cannot have enough of! It is good to go any crispy snacks and beats the usual sauces, dips hands on. Hence, it is an obvious choice to make it for parties, meet-ups. 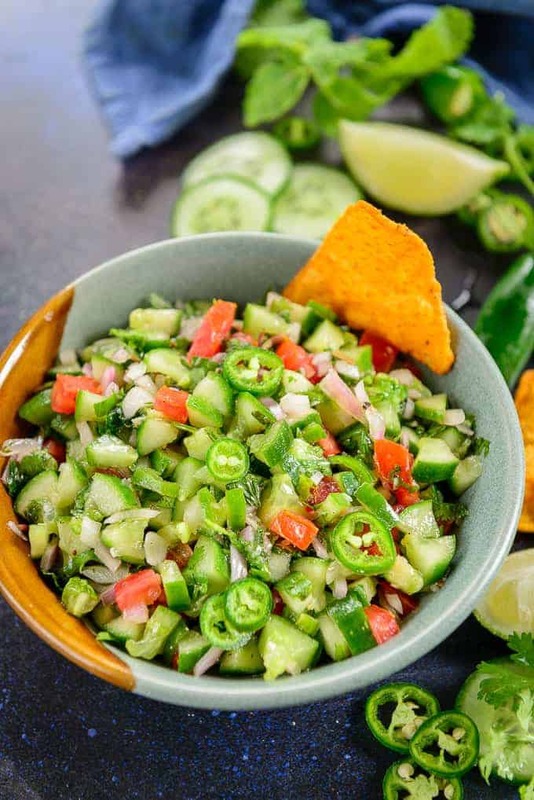 Cucumber Salsa is a fine mix of farm fresh cucumbers, spices, tomatoes, Jalapeno and onions. Although tomatoes are constant in any salsa, in Cucumber Salsa they take a back seat. Because the highlight of this side is cucumber any day. – Make sure to evenly chop all the veggies. As huge chunks of veggies spoil the salsa completely. 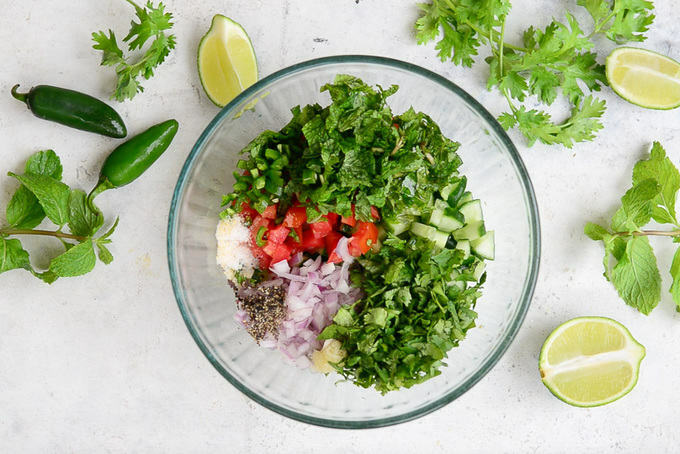 – Use fresh mint, lime juice, salt and pepper and cilantro as they very much enhance the flavour of the salsa. – To coat spices and veggies like fresh cucumber, bell peppers nicely, add a little olive oil. Most importantly, fret not if you do not really like cucumbers. This salsa doesn’t taste very cucumber-y because the other veggies nicely balance its taste. But, Cucumber Salsa is very light and fresh than all the other salsa that I have tasted. And, I am sure you would agree once you make it. Smother it on tacos, munch it with tortilla or chips, Cucumber Salsa is worth a shout out. Read its recipe and try? You can add other veggies and fruits to this salsa and make a new variation for yourself. Here are some of the ingredients I like to add for a change to the basic recipe. You can add Ranch Salad Dressing or Sour Cream to the salsa for a creamy version. Can you freeze Cucumber Salsa? Salsa is best had fresh and the flavours are lost even if you keep it for a day. I strongly suggest to make your salsa fresh and just refrigerate it for 1-2 hours for the flavours to blend. Freezing cucumber salsa is a big no for me. 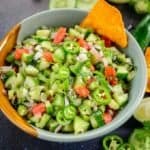 What to serve with Cucumber Salsa? You can serve this salsa just on it own as a salad. You can serve nachos with it or even top it over grilled salmon or tilapia. Add all the ingredients in bowl. Got a stock of fresh cucumbers piling up? This zesty Cucumber Salsa is a great way to use them up! Loaded with full on Mexican flavours, I find recipe for cucumber salsa very helpful for snacks and brunches! Refrigerate the salsa for 1-2 hours.